It isn’t Amazon’s entry into logistics that should concern you, it’s their mindset. The days of paper-based transactions and lack of immediate visibility into all aspects of business operations are coming to an end. Let’s face it – access to nearly anything at your fingertips is expected in today’s world. E-commerce delivery cycles are measured in hours. You can order a pizza and get real time updates on who is making it, when it goes into the oven to bake, and when it leaves the store on its way toward hot-and-ready delivery to your doorstep. You can order a ride at the touch of a button on your phone and have transit time and cost quantified upfront. If you don’t think these service level expectations are going to impact the global logistics landscape then you are kidding yourself, and you’re headed straight for the proverbial brick wall. The impeding impact will leave you dazed and trying to catch up to an ever-increasing velocity of business, data and customer expectation. Consider for a moment the regulatory landscape facing the industry from a compliance, quality and security perspective. Layer in advancements in messaging standards like Cargo XML, Cargo iQ (formerly Cargo 2000) and interoperable systems like ACE (Automated Commercial Environment for customs) and you have a ticking clock that will change your business sooner rather than later. I’m not trying to scare you (I’m sure these things are already keeping a fair number of you up at night), rather I’m trying to encourage you to think about the commonalities of all of these regulations, systems and messaging standards. What common thread are they all driving toward? I’m sure the answer to that question could be debated endlessly, but I propose the answer is simple: visibility. Visibility into the quality of products in the logistics cycle, visibility into who handles those products, visibility into the security and integrity of those products, and visibility into the transactions amongst the parties that manufacture, ship, broker and ultimately take delivery of those products. I propose that this common desire for better visibility can be served in all respects by understanding 3 primary pieces of information: where is it, what condition is it in, and who has it? I propose that understanding these 3 things at all times, in real time, from point of manufacturing to point of delivery is a common foundation to delivering compliance will all current and impending regulations. I also propose that this information will drive interoperability with the host of IT systems and messaging standards in use by various players in the industry. That’s not to say those things are the turnkey “holy grail” by any means, but they are necessary components to a solid foundation that will provide adequate building tools for the impending “e-ing” of the logistics industry. For those of you that are still in denial that Amazon isn’t trying to do for the world of logistics what they did for the world of e-Commerce, you can probably stop reading here . . . Still with me? OK. So full disclosure now – I’m in the business of providing real time monitoring and tracking solutions to the logistics industry. Does that mean you should ignore or otherwise discount my perspective on all of this? It’s true that I don’t have your knowledge of the industry. I don’t understand the inner workings of the global supply chain like you do (but I would certainly argue that our tracking devices know more than you do about what is really happening out there). What I do know however is how some of the forward-leaning players in the industry are leveraging real time tracking and monitoring solutions to prepare for the world of “e-Logistics”. Our typical customer deploys real time tracking and monitoring to harvest the basic value proposition – knowing where product is and what’s happening to it so they can enhance overall quality and provide their end customers with greater peace-of-mind that the goods they are shipping are in accordance with plans: on time, in good condition and handled with the expected care. 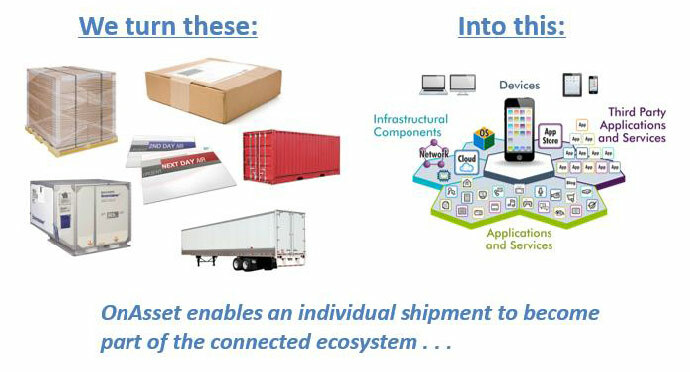 Knowing where your product is (through GPS and other location sensing technologies) in addition to environmental monitoring (temperature, humidity and pressure) coupled with handling (movement and shock detection) and finally security (package integrity) are being realized as integral tools for better visibility into the supply chain. This generates obvious and immediate value to shippers and logistics providers, but it only uncovers a portion of the total ROI that can be realized. The visionary customers do the same thing, but they take it layers deeper. They see a tool for achieving deeper understanding of how the supply chain ecosystem works together. They share data with their partners and customers. They use the real time data to generate autonomous transactions that increase the velocity and efficiency of their business. They think beyond the typical, and know that they can now be immediately informed when a product gets delivered – and they can use it to send their customer a condition report showing a quality record throughout transit while also generating a virtual invoice. They analyze quality and time-based delivery metrics in real time to improve service levels. They automate the exchange of waybill and customs information using business rule triggers. In short they are driving the creation of new “e-Logistics” services. It’s real innovation through the creative use of location, condition and chain-of-custody data to automate historically manual transactions. It’s exactly what Amazon has done with the world of commerce by transforming brick-and-mortar experiences into virtual transactions at the click of a button. What if an intelligent package could perform a transactional role in the supply chain? What if that intelligent package could use automated business rules to trigger documentation delivery to necessary IT systems and personnel based on its real time location and status? What if the shipment could auto-book itself, and transact with handling agents autonomously? What if the shipment could generate automated event messaging that are natively compatible with industry standards? Now we’re seeing the power, and starting to glimpse the possibilities of e-Logistics. Beyond that you are now gathering large scale supply chain performance information that can drive operational improvements while keeping the IT and “big data” crowds satiated in their never-ending thirst for data. I can tell you this with certainty – I’ve never met a customer that didn’t achieve surprising insight and a new understanding of what is really happening in the field once they deployed real time tracking and monitoring technology. So back to my point. It’s important we recognize that Amazon is thinking about logistics with a different mindset. They think about an ecosystem of make-it-easy transaction services (“app-ifying” the supply chain if you will). Amazon lives in the world of delivering immediate gratification, and they think about everything in terms of how it can be served up with button-click ease. There are clear signs that some players are adopting a similar mindset, and there is still time, but you have to move now – otherwise watch out for that wall.